“ Since 1981, I've been creating art that stirs the emotions of the viewer. As I've grown as an artist, my work has become more of an expression of my soul. Images in nature, art, and new technology all influence me. I'm especially intrigued by the moments in life that catch my eye, random ideas that erupt in my mind, and words people say that just hang in the air. I'm constantly re-formulating the process of my creative thinking. I'll observe something that strikes a chord with me, tuck it away in my mind, and later it becomes an inspiration to me. As a result, my art can be lighthearted and whimsical or deeply symbolic. Imagination is the most powerful tool humans possess." John spent many afternoons watching television shows and movies that portrayed perfect people, in perfect families, living in a perfect society. These shows would prove to have a profound impact on his career path. First, he pursued a career in the idealized world of advertising design, receiving a degree in Graphic Design from Mt. San Jacinto College, followed by a degree in Commercial Photography from Brooks Institute. Throughout the 80s and 90s he gained national recognition, winning numerous awards as a photographer. During this time, any spare moment was dedicated to creating fine art, crafting art furniture and restoring vintage motorcycles. In 2003 John closed his photography studio to pursue his passion for sculpture. Since then he has created a diverse body of work, pieces of which can be found in both private and corporate collections; this work has also been shown in galleries and exhibitions worldwide.
" John Petrey’s sculpture is visually, conceptually, and materially provocative. 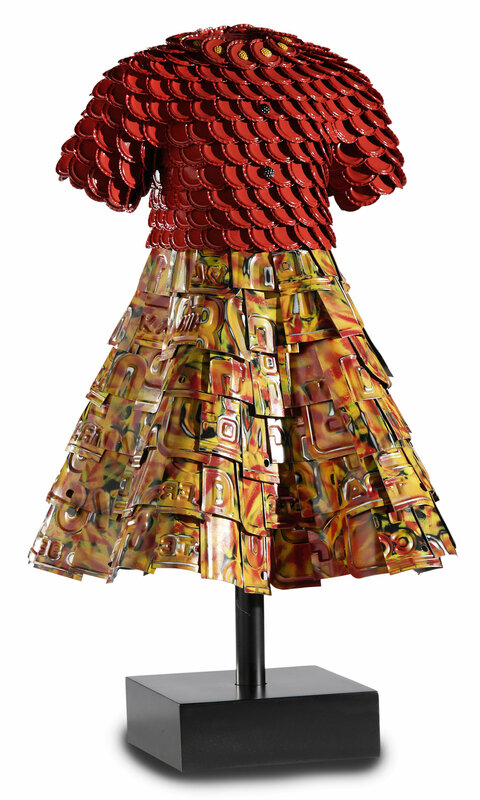 His dress series—crafted from large quantities of recognizable, often “everyday” materials such as plastic spoons, poker chips, license plates, and wooden rulers—reflects his ability to bring disparate parts into a cohesive and powerful statement. While his work is serious, it is also imbued with the artist’s sense of humor and his willingness to be playful. A background in commercial photography and graphic design, as well as time spent constructing stage sets, encouraged what could be described as a “sympathetic” eye for good form and content and a knack for knowing how to engage a viewer. Petrey draws on personal memories and reflections yet taps into topics of a more universal nature. As one example, clothing—whether wearable or not—is a familiar form. It denotes a body and that is something every human being can relate to— whether the kind of dress is recognized or not. Like other contemporary artists who utilize clothing as iconography, Petrey recognizes the value of dress as a connective tissue, an innately human signifier. Not only does it correspond to cultural, social, political, and personal issues, it defines, protects, and “brands” the body. It is something we know and use. This makes it powerful—rich with layered, and variable, meaning. Petrey has translated his response to the “utopia” suggested by those influential factors into finely crafted sculptural forms that encapsulate a mood, as well as stand on their own as visual statements. While he has made both boy’s and men’s suits, these pieces tend to focus on feminine attire—the language of women’s dress offers myriad opportunities for the artist to connect to broader topics such as sentiment, memory, and social and cultural issues. Crafted in three different sizes, to reflect the different stages of a woman’s life, Petrey’s garments require large numbers of materials to clothe the base structure made of resin, steel and fiberglass. To find the needed quantities of plastic serving ware, poker chips, yardsticks, miniature playing cards, bottle caps, and pressed tin (this is not even a definitive list), he needs to constantly search junk shops and flea markets, as well as take advantage of friends in the salvage business. Petrey shapes the re- purposed materials to imply folds and draping. As he has developed the series, he has also started to play with the metaphor of metal as armor. While he may emphasize style, color, and neckline as attractions (as many women would likewise keep in mind), he also pulls no punches regarding the nature of the metals he may be using and does not always disguise sharp edges and points. To Petrey’s thinking, this is the “Come notice me. Stay away!” conflict—the emotion and mindset of the wearer being reflected in their sartorial choices. The scale of the piece does seem to dictate the style of clothing—with evening gowns, kimono, and Elizabethan dresses, as well as the shirtwaist style, being produced at the larger size. Interestingly, this reinforces an intangible relationship between style of dress and maturation. It makes sense to see a draping, firey-red evening gown at a large size as it corresponds to a full-fledged woman on a red carpet. However, since this is sculpture, not actual adornment, Petrey can also let his imagination soar— shifting proportions as construction warrants or as his imagination encourages. Varying styles reflect Petrey’s increased interest in fashion trends past and present, including, in his words: “everything from Japanese subculture street fashion to the high couture runways of NYC and Paris.” His presentation—as well as his choice of dress style and materials—evoke different characters, icons, or even, stereotypes. Without being specific and direct about it, he can use the language of the iconic to provoke feelings or responses in viewers. The re-purposed materials act almost as talismans— reinforcing a subtext that will be as individual as each viewer. The materials themselves can evoke feelings, spur memories, and suggest the nostalgic. They also tend to read as familiar (as opposed to exotic)—this allows them to become memory-inducers and points of recognition. In his artist statement, John Petrey states: “My art can be lighthearted and whimsical or deeply symbolic.” He has been approaching this rather effectively through the language of dress—offering sculpture that is full of meaning (and potentially, emotion) without being schmaltzy. Having his work in the gallery, or in a home, is like having old friends that you have not seen in a while come to visit—they are both new and familiar at the same time." The larger pieces act as a vehicle to create “sky’s the limit” work. Petrey’s work ranges from historical to cutting-edge street fashion depicting fantasy, danger and allure—sometimes all in one piece. This work is often a juxtaposion on the stereotypical belief that women use fashion to “lure” a mate, through the use of garments paradoxically layered as a “coat of armor.” The sensual side beckons one to “come close” while the protective side sends the message “stay away.” These larger-than-life figures can be imposing or intimidating—adding force to the message. Although every piece is inspired by fashion, it is ultimately driven by materials.